Finding an experienced professional to provide reliable and affordable lawn care services is easy when you call Olson's Lawnscape. 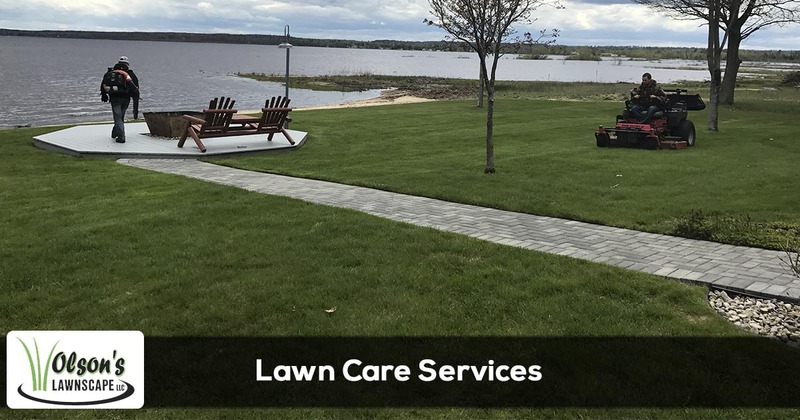 To speak with one of our lawn care specialists, call 906-399-1718 today. How many times did you find yourself in the situation of having to mow your own lawn but call some company to deal with a pest infestation, another one to build you retaining walls and a third to help you with snow removal? Besides being annoying, having all sorts of bills paid to all sorts of companies may mess around with your budget. This is why we strived to get all certifications, as well as experienced employees and licensed experts to cover all your needs for all year long. You don’t have to spend time, money and effort with several contractors because we can deliver any and all lawn care and landscape services. Your sparkling green, thick, lush and healthy lawn is our business card, this is why our lawn care services include complete mowing with daily sharpened blades, changing the mowing pattern weekly, string trimming around all edging, trees, and hardscapes, removal of freshly cut grass from all requested areas, sidewalk and driveway edging of grass and soil, seasonal aeration and dethatching, and so on. Your lawn will be manicured, healthy, thriving and inviting all year long. A lawn cannot thrive in the lack of proper fertilization and weed control – mandatory tasks to preserve its health and development. Unfortunately, many companies pour cheap substances on the ground with no consideration for their harmful effects. We decided to offer integrated fertilization and weed control programs that fully comply with the Michigan Department of Agriculture, performed by licensed professionals. We tailor our interventions depending on the soil’s chemical composition and needs. We use top-shelf labels that are safe for the environment and the inhabitants. We use only selective treatments that repel weeds without affecting the grasses. Our residential and commercial pest control programs are tailored to get you rid of unwanted critters without damaging the landscape or endanger your health. Our pest control programs involve initial assessments of the situation, interventions and follow-ups to make sure the pests don’t return. All our treatments are tailored to fend off the pests and safeguard beneficial insects. We are licensed professionals, and can maintain your lush and beautiful landscapes in full compliance with the industry’s standards and trends. Besides the usual trees and shrubs regular pruning, we also offer seed and sod installations, flower and vegetation planting, and more. Our landscaping services cover a full year and are adaptable to the seasons, your needs and wishes in terms of looks and functionality. Spring and fall are certainly two busy seasons for all homeowners, as flower beds need to be tidy, trees and shrubs need to be pruned (and the vegetal debris removed), and fall leaves need to be taken away for aesthetic and health reasons. We are equipped and qualified to perform full spring and fall cleanups to make sure every spot of your lawn and landscape is neat, tidy, refreshed and ready to thrive. Winter has its share of fun, but its worst side is snow and ice piling up, debilitating walking and driving and affecting businesses’ flow of operations. Our snow removal and deicing services cover both residential and commercial properties. We want to keep you safe, your driveways and sidewalks clean and your business and everyday life free from winter nuisances. We only use top-shelf equipment and substances that don’t harm surfaces and hardscapes and we are ready to serve you no matter how harsh the weather is. Our integrated services and team of professionals is here to help you maintain a lush and thriving property all year long. Give us a call or ask for a free online estimate, all our work comes together with a risk-free warranty, so you have nothing to lose if you try us out! Call us at 906-399-1718 for more details.